Nolans Road certified organic* extra virgin olive oil has won an enthusiastic following among leading chefs and food writers. It is now available at the Mount Gambier Farmers Market on the first Saturday of every month. Dee Nolan’s olive groves are at Hynam, near Naracoorte. Her oil takes its name from the country lane that winds through a canopy of magnificent river red gums by the groves. 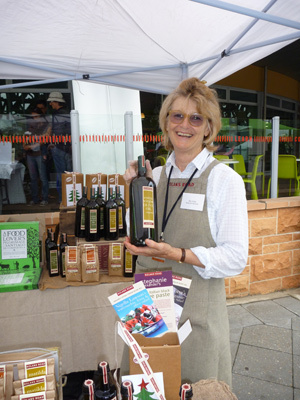 Stephanie Alexander recently nominated Nolans Road as one of her favourite extra virgin olive oils. Nolans Road also features in a Nigella Lawson cook book. In December 2012 Nolans Road was awarded two major awards in the A.NZ.SA.Olive Oil Awards 2012. As well as extra virgin olive oil, Dee also sells new-season locally-grown certified organic Kabuli Chickpeas and Matilda Lentils along with other seasonally grown produce from her garden.